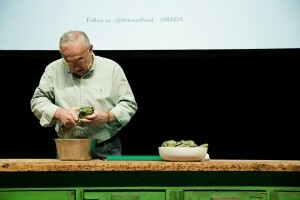 In 2013, Lucky Peach helped organize our MAD symposium under the theme of “GUTS”. The topics discussed during that two-day event—and later published in a Lucky Peach booklet called GUTS are still as relevant as ever. Every Wednesday until the GUTS run out, we’ll be publishing a feature from the collection. 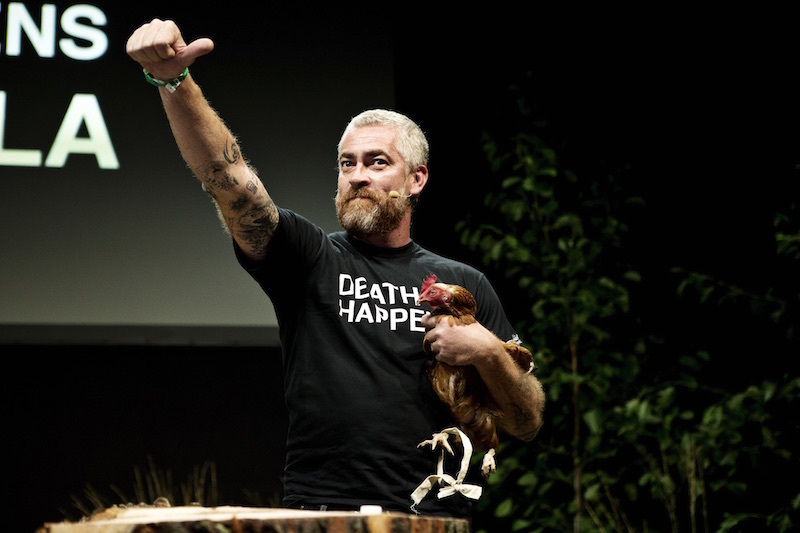 For this final week, Alex Atala presents a recipe for chicken (including the slaughtering and butchering process). In the years that I’ve worked in the kitchen, I’ve always found it funny how distant the urban cook is from the animal. There is a vast disconnection between the piece of meat that is on the top of their kitchen table or in the pan, and the living thing that once walked, pecked, and laid eggs. The act of killing has always been present in my life. I come from a family where hunting and slaughter was part of our lives. My grandmother, my mother, and aunts killed chickens and pigs for our daily consumption. None of that seems outrageous to me. My upbringing made me more respectful to the ingredient, to a life waived for my sake. This recipe goes back to the oldest Brazilian traditions. In our country, the way to consume birds has always been to fry them with garlic, lime, and parsley. When colonialism brought more chicken to the Brazilian diet, we began cooking frango à passarinho, ”chicken, bird style.” The chicken is minced into small pieces, marinated with lime and a little bit of salt, and then deep fried with a lot of garlic. 1. I wanted my presentation to make the audience think about the step between animal and ingredient: death. And so let’s concentrate on that first. Tie the feet of a live chicken together. This will make the process much easier. Hold the chicken by its feet, and cradle it under your arm. Put your thumb on the top of the head, almost on the nape of the neck. Stretch the neck as much as you can and then pull down swiftly and strongly. You must use enough force to break the neck. The animal will still appear to struggle, but it feels no pain. A few electrical impulses are sent through its body after it dies; you’ll see this as movement. Hang the chicken upside down for a few minutes, letting its blood run towards the head. 2. Now we have two paths we can follow. If we are preparing frango à passarinho, we just let the body of the chicken cool. The blood will coagulate and when you fry the meat, and the flavor will be much better. 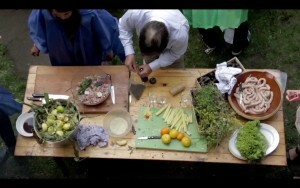 But if you want to save the blood for other preparations, like galinha ao molho pardo—a very famous recipe in my country that involves cooking the chicken in its blood—you will need to remove some of the feathers around the neck, pierce a small hole in it, and let the blood out into a small pot with vinegar or lime. The lime or vinegar will prevent the blood from coagulating, so you can save it for a later preparation. Once you choose your preparation, it’s time to remove the feathers. 3. You can deplume the chicken using hot water. Immerse it in hot water, then pluck the feathers with your hands. This is the easiest procedure, and allows you to keep the chicken skin. But if you’re like me, and you’ve killed a chicken on stage at a food symposium to make a point about connecting ourselves to death, you don’t clean the chicken until later in the evening, with people watching you, without any equipment except a dull pocket knife. In that case, there is another way to clean the feathers—the way that I learned to do it while hunting. Put the chicken on a surface with its back down. Find the vent—the hole through which a chicken excretes and lays eggs—and cut all around it until you can remove it. Pull the chicken’s intestines out of the opening with your hand. Slice all the way around the head and try to pull it off in one motion, along with the connected guts. Use your fingers to unstick and separate the liver, heart, and gizzard from the other guts. The chicken I killed in Copenhagen was laying, which means that there were some pre-eggs inside as well. Put all of this into a brine of salt water. Once you remove the organs, you can start removing the feathers. This time, we have to remove the skin as well. Through the same opening that you removed the intestines, you can begin using your fingers to separate the skin from the chest meat. Remove all the skin from the chest then start to separate the skin from the back. Working from the back, pull hard on the skin until you get to the tail. Cut the tail off and continue to pull and remove the skin from the legs and the wings. The most difficult parts are the back and the end of the wings. 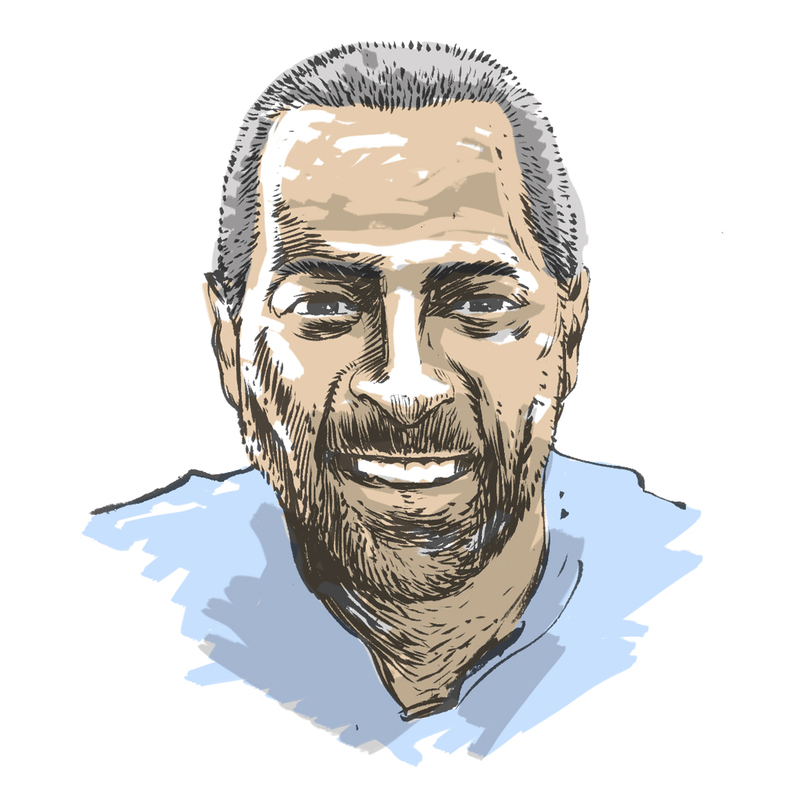 This is a brutish procedure, and much more difficult to execute than the hot-water method. But with a little bit of practice, it’s possible to do it very quickly. 4. Now that we have a chicken without guts or skin, we have to remove the bones. I follow the classic way. Debone the thigh and the drumstick, then the wings, starting closer to the breast. Starting with the ribs, separate the chest and the back bones. It’s okay to keep a few pieces with bones, but definitely remove the leg bones. 5. Slice the deboned chicken into small pieces. Marinate the meat and organs with lime, salt, and a little bit of garlic. Leave for a few minutes, then remove from the marinade and dry with a paper towel. Deep fry in hot oil until golden brown. In the same oil, fry a handful of garlic until light brown. Sprinkle the garlic on top of the fried chicken and finish with fresh chopped parsley and lime juice. The London pioneer provides a simple and dazzling presentation. 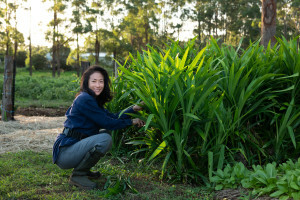 At the first Sydney MAD Monday, Palisa Anderson, director of Sydney restaurant Chat Thai and first-generation farmer of Boon Luck Farm, shared stories from her childhood, as well as her farming practices and approach to utilizing sustainable Indigenous ingredients in her cooking.